This is a dogwood shrub with something of an identity crisis. On the scientific side the currently accepted scientific name of this dogwood is Cornus sericea. Although the name Cornus stolonifera is in wide current use. Take your pick. Then on the common name side things get crazy. There are at least 18 common names on the books for this dogwood. They include Red Twig Dogwood, Redosier Dogwood, Western Dogwood, American Dogwood, and Redstem Dogwood. However no matter what you call this plant, it is an attractive landscaping plant, with deep red stems and twigs for winter color, many creamy white flowers in the spring followed by attractive white fruits, and spectacular maroon fall leaves. 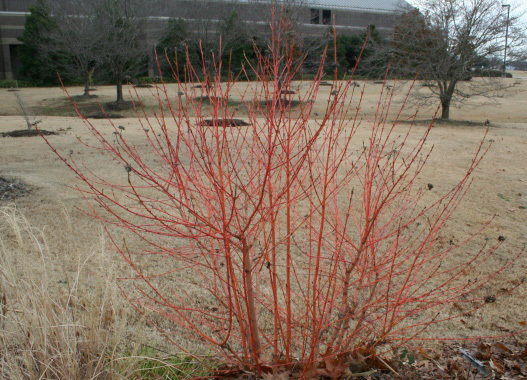 Red Twig Dogwoods are fast growing, many stemmed shrub, reaching a mature size of 4-8 feet tall with a spread of 10 feet. Stems and twigs dark red when young, gradually fading to grey-green, becoming red again in the fall and winter. It prefers sun but tolerates partial shade. It also tolerates a wide range of soil conditions including flooding and drought but prefers moist to wet, slightly acidic soil (pH range of 5.5 to 7.0). This is a good plant for boggy spots on the property or on lakeshores and streambanks. Leaves are 2 to 4 inch long and arranged opposite with prominent lateral veins that curve toward the tip and smooth edges. The color is green above, pale green below turning red in the fall. Unlike many dogwoods, this shrub displays no large, showy bracts. Rather, the Red Twig Dogwood has small, dull white or creamy flowers in flat top clusters about 2 inches across appearing in late May to early July. Maturing in August to September, the fruit is dull white, 1/4 to 1/3 inch in diameter in rounded clusters. Individual plants generally first bear fruit at 3 to 4 years of age, but older plants are more prolific. Fruit is low in sugar so it is initially less attractive to wildlife and less inclined to rot than other fruits, staying on the plant through the winter and availabile when other fruits are gone. Eaten by songbirds, grouse, quail, partridge, ducks, crows, and other birds. This shrub is the preferred nest site of American goldfinches. Once established, the Red Twig Dogwood is drought tolerant and, for gardeners in rural areas, less palatable to white-tailed deer than many other ornamental shrubs. All shrubby dogwoods, however, tend to display nondescript brownish or greenish-yellow twigs during the summer, the bright color developing only as the cool weather settles in. These plants are best used in large drifts, where the sheer number of stems makes a bright splash against the snow, or where they can anchor a grouping of white-stemmed birches to make a durable and pleasing winter display. Unlike many trees that require a certain degree of maturity before displaying their unusual bark patterns, shrubby dogwoods lose their bright stem coloration with age. As the twigs mature and increase in girth, the bright color is lost and the bark becomes brownish and drab. An early spring thinning, cutting a portion of the stems back to three to four inches above ground level, will ensure an annual crop of vividly colored young stems to enjoy over the coming winter. The many cultivars of Red Twig Dogwood offer differences in size, color of leaves and color of the stems. Alleman's Compact is a compact plant reaching a height of 4 feet. Kelseyi is a dwarf cultivar only three feet tall and three feet wide. Cardinal is a selection developed in Minnesota with bright red stems. Coloradoensis is a native of the western U.S. with red branches and bluish white fruit. Flaviramea called the Yellow Twigged Dogwood has bark that turns yellow in winter. Midwinter Fire has a winter stem coloration that is a combination of red, yellow and orange. Silver and Gold is a cultivar of Flaviramea that has both yellow twigs in winter and green foliage that is edged with white. White Gold is a variegated form of 'Flaviramea' that has white and green leaves. nine inchsection each section so there is a bud just below the top of the cutting and just above the bottom of it. Remove all side branches. Dip the cuttings into rooting hormone. The cuttings can be placed either directly into the ground (as long as the garden soil is mixed with some perlite or vermiculite for drainage) or in pots with a mixture of potting soil and vermiculite or perlite. A cold frame is a good place to put your cuttings, whether planted directly into the soil or in pots. Keep the cold frame closed over the winter. (Cornus stolinifera Farrow ppaf) A new compact selection of the ever popular Baileyi red stem dogwood. Dark red winter twigs and a compact, nonsuckering habit. Developed by Mike Farrow of Holly Hill Nursery. This wonderful shrub will add sensational color in the winter with its intense red stems. Bring the outdoors in and use Arctic Fire as a cut stem for holiday arrangements or for season long color indoors. Arctic Sun - Cornus - Red Twig Dogwood - Very Hardy! C. sanguinea Cato ppaf cbraf) A brightly colored compact dogwood with rich yellow stems tipped with blood red coloration. Developed by Andre van Nijnatten the same breeder who brought us Winter Flame .